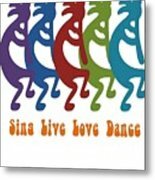 Sing Live Love Dance Tribal Kokopelli by Taiche Acrylic Art - 7.000" x 10.000"
Sing Live Love Dance Tribal Kokopelli framed print by Taiche Acrylic Art. Bring your print to life with hundreds of different frame and mat combinations. Our framed prints are assembled, packaged, and shipped by our expert framing staff and delivered "ready to hang" with pre-attached hanging wire, mounting hooks, and nails. There are no comments for Sing Live Love Dance Tribal Kokopelli. Click here to post the first comment. Kokopelli is a fertility deity, usually depicted as a humpbacked flute player (often with feathers or antenna-like protrusions on his head), who has been venerated by some Native American cultures in the Southwestern United States. 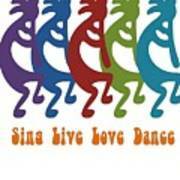 Like most fertility deities, Kokopelli presides over both childbirth and agriculture. He is also a trickster god and represents the spirit of music.